It would be great if you could go deep into the Earth and see what’s going on, but that’s impossible — despite what Jules Verne wrote. The average distance from Earth’s surface to the center is 3,960 miles, and no human has ever come close. Several books and movies have portrayed such fanciful feats, but the truth is that people have barely penetrated the crust. Miners in South Africa have gone down about two miles; and if that’s not the record, then the real one can’t be much farther. So instead of going on a fantastic journey, you must settle for a diagram (as shown in Figure 1) based on informed speculation. Looking at it may cause you to wonder, “Well, if nobody’s ever been down there, then how do you know what it looks like?” Great question! Here’s the quick answer. Figure 1: A cut-away view of the Earth. Our understanding of Earth’s interior rests on a combination of inference, analysis of alien objects, sound waves, and rocks and minerals. Alien objects are not UFOs, but rather meteorites and such that have fallen to Earth. These uniformly reveal a high percentage of iron. Because these alien objects are the result of the same process of planetary formation that produced Earth, the assumption is that the proportion of iron in these objects is probably about the same for planet Earth. That suggests an incredible amount of iron beneath your feet. Earthquakes produce sound waves. Over the past several decades, seismologists (people who study earthquakes) have placed within the crust hundreds of “listening devices” that record and analyze sound waves made by earthquakes. Some of these waves, it turns out, have peculiar characteristics: They cannot penetrate liquids, or liquids deflect them, or they travel at different speeds through liquids and through solids with different characteristics. Analysis of the tracks and characteristics of literally hundreds of such waves, plus the previous inference concerning iron, provide much of the input for Figure 1. Also, geologists have studied lots of rocks and minerals that have been thrust up through the Earth’s crust. Analysis of these materials reveals a relative scarcity of iron, which suggests this substance must be concentrated deep within the Earth. The composition and temperature of Earth’s interior are the reasons nobody has ever gone there and probably never will. Most of that realm is molten or almost molten. Thankfully, not only is it out of sight and out of mind, but also out of touch. Were it not for the insulating crust, life as we know it simply would not exist. Directly beneath the lithosphere lies the asthenosphere. Measured in the thousands of degrees Fahrenheit, its rock assumes a plastic, almost molten quality. 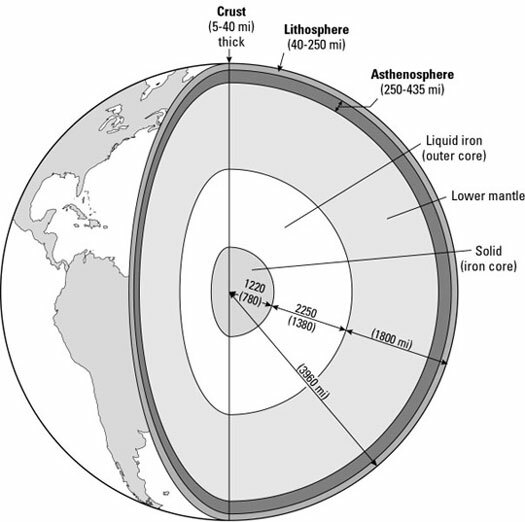 Directly beneath the asthenosphere is a vast volume of somewhat stronger rock, and below that liquid iron of the outer core and solid iron of the inner core that is hotter still (as shown in Figure 1). Altogether, that vast volume of incredibly hot stuff is a powerful source of pressure — tectonic force. Indeed, it is mighty enough to create and rearrange continents, and in the process build mountains and cause earthquakes and volcano eruptions to occur. This knowledge has been available for only a couple of decades. But the idea of a force powerful enough to move continents has been around for centuries.